The audacity of President Trumps decision to change the status of Jerusalem without consultation and in the face of complete opposition from world leaders suggests a degree of ineptness or a callous disregard for the deepest feelings of those concerned. King Abdullah of Jordan, currently Custodian of the Holy Sites in Jerusalem, has warned of the dangerous repercussions. Perhaps a glance at history is appropriate. Whatever our faith we tend to view Jerusalem from our own perspective. While sacred to Jews, Muslims and Christians, the site is however much older than any of these religious traditions, artifacts show it was first settled between 4500–3500 BCE. The original inhabitants of Jerusalem were Phoenician Canaanites, their culture is believed to have pioneered the Mediterranean system of agriculture, intensive horticulture, grain growing and commercial olive cultivation. Old Testament scripture states that the land is named after Canaan, a son of Ham, a son of Noah, the ancestor of the Canaanite people. The Canaanites of the southern Levante worshipped a panoply of gods; the first known mention of the city of Jerusalem was in c. 2000 BCE. The name Jerusalem is of Canaanite origin, meaning “Founded by Shalem”: Originally ‘Urushalim’ or ‘Urushalem’the prefix uru means ‘founded by’, and the suffix salem or Shalem refers to the Canaanite ‘god of dusk, of the setting sun and of health and perfection’. The Sumero-Akkadian name for Jerusalem (1330 bce) uru-salim, means “foundation of [or by] the god ‘Shalim‘ from Hebrew/Semitic meaning ‘to found, to lay a cornerstone’. According to the Old Testament Abraham, the patriarch of Judaism was a native of Ur of the Chaldeans, in Mesopotamia, now south eastern Iraq. 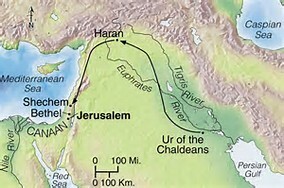 He was led by God to settle in Haran. The Torah traces his lineage through his grandson Jacob and through his twelve sons who became the ancestors of the twelve tribes of Israel. The name Israel comes from the renaming of Jacob following a heroic struggle when he wrestled with an angel. The Hebrew bible states the name is derived from ‘yisra’ meaning ‘to prevail over; and el referring to ‘God, the divine’. Following a famine Jacobs descendants, the Hebrews, migrated to Egypt and under the patronage of Joseph, Jacobs son, established a thriving community which in time became viewed as a threat to the indigenous population. After Josephs’s death they were enslaved in Egypt for 400 years until Moses led them to freedom. The Hebrews were directed through the Sinai Peninsula to Canaan, the ‘land flowing with milk and honey’ promised to them by their God. Canaan had an indigenous population of both settled and nomadic groups; the Israelites were commanded by their god to conquer Canaan. The conquest occurred under Joshua in c.1406BC, the Book of Joshua states that Canaanites are included in a list of nations to exterminate, and later described as a group which the Israelites had annihilated. Today this has been equated with genocide. 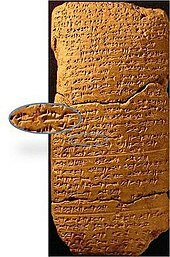 PHILISTIA (present day Gaza on the Mediterranean coast of Israel) was the name of a region between Egypt and Canaan believed to be founded c 2,100BC. The Old Testament states that the inhabitants, Philistines are also descendants of Noah, through another of Ham’s sons. In Hebrew, Philistine literally means ‘of Palestine (Phillistia). Though not a part of Canaan and never conquered by the Israelites, Phillistia was in the area promised by God to the Israelites. The two nations were initially on peaceful terms but eventually warred for centuries. Goliath the giant was the Philistine from Gath, who was killed by David (later King of Israel) with a slingshot stone. Under the later Roman occupation of Judea, Phillistia was renamed Palaestina, the name Palestine and the Arab word Filistin originate from the Romanized Palaestina. According to the Bible, the Israelite history of the city of Jerusalem began c.1000 BCE when the city of David was sacked by King David who later united the 12 tribes of Israel. Solomon his son built the Temple of Jerusalem, however following his death the kingdom was split into two parts, 10 tribes of Israel and 2 of Judah. The Jewish people were exiled in the Assyrian conquest (740 BCE) and in the Babylonian conquest (587/6 BCE) . After the Fall of Babylon to the Persians, King Cyrus the Great allowed the descendants of the tribes of the Kingdom of Judah to return to Israel. The 10 tribes who never returned are referred to as ‘the Ten lost tribes of Israel’ who were scattered globally in the diaspora. Recent History: In 1917 in response to the Zionist political movement, Great Britain recognized the rights of the Jewish people to establish a “national homeland for the people of Palestine”. Zionism is not a religious term, it defines the political movement coined in 1890 to promote the return of the Jewish people and the resumption of Jewish sovereignty in the Land of Israel. The name comes from the hill Zion, on which the Temple of Jerusalem was built. In 1947 the UN voted for the Partition of Palestine, in 1948 Britain withdrew when their Mandate for Palestine as a Protectorate ended. The Zionist movement immediately declared a State of Israel in Palestine, triggering the Arab invasion and later the Arab/Israeli war and the eventual Israeli occupation of Palestinian territories. Since that time Palestinians have been dispossessed of their rights and remain stateless. The restoration of East Jerusalem as the Palestinian capital has been an inherent part of endless Peace negotiations for a two State solution until the recent declaration by President Trump. Post script: Palestinians are now seeking a non partisan peace broker to replace the US in negotiations. This entry was posted in Conflict Resolution, Power Abuse by Carol Lamb. Bookmark the permalink.